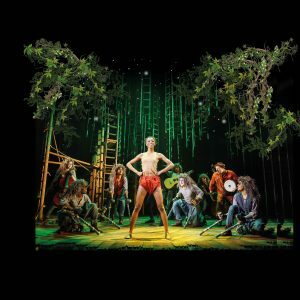 I was keen to see The Jungle Book after learning that it was created by The Children’s Touring Partnership, which seeks to create bold and imaginative theatre of the highest quality for children aged eight and above, throughout the UK. The Children’s Touring Partnership have recently produced The Boy in the Striped Pyjamas, which was fantastic and Running Wild, an adaptation of the novel of the same name by Michael Morpurgo, which I also thoroughly enjoyed. Yablochkov Candle is an aerial exploration from Finnish performer Ilona Jäntti and an incredibly unique vocal performance from singer-songwriter Aino Venna. The live music complements the acrobatics perfectly, or should I say the acrobatics complement the music, for each art form is of equal importance throughout. 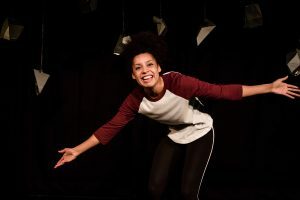 Ramps On The Moon speak volumes with their ability to make the powerful drama Our Country’s Good accessible to D/deaf and disabled theatre lovers whilst still maintaining the standard of a mainstream production. Fiona Buffini’s direction cleverly embellished the action with British Sign Language throughout, and the wonderfully diverse cast, including D/deaf and disabled actors, was extremely emotive in both their vocal and physical expressions. The energised and captivating sign language is performed by either the speaking actor themselves or by another character in the scene (which takes a minute or two to grasp, yet the complexity certainly adds a creative dynamic). For an audience member who does not know the meaning of the gestures (like myself) it is not a hindrance, but instead a fascinating extension on the actors’ expression (and an impressive one at that). This uplifting story, in which a play helps the officers and prisoners to release the chains of judgement and regain their sense of humanity, is not to be missed. The show holds a strong structure and does not include any unnecessary spectacles (no ground breaking over rehearsed cheesy-ness), instead the story is allowed to blossom organically and the text has the focus it deserves. Although this production is impressively unique, it is not flawless. The opening is slow, with the movement of the chorus of prisoners being perhaps too improvised and slightly aimless. Transitions are of a simple nature and often bring the audience out of the world, however it would not be long til they are again drawn in by the following scene. Officer Ralph, eager to direct the cast of prisoners, is played by the slightly hammy Tim Pritchett. His love for the gentle prisoner Mary Brenham, played by Sapphire Joy with a perfectly shy demeanour, and her love for him is not well established, causing their affair to seem sudden and fake, whereas the relation between Mary and John Wiserhammer, who is brilliantly portrayed by Tom Dawz is beautifully honest and moving for the audience. 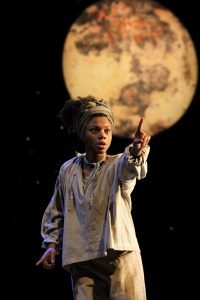 Filled with moments of suspense, comedy, heartbreak and hope Ramps on the Moon have brought us tears and laughter with this original production Our Country’s Good and prove, yet again, how inclusive theatre can and should be. Review written by Lauren Maxwell. 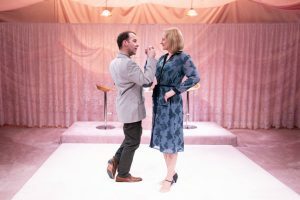 On entering the Jerwood upstairs theatre one is first struck by Fly Davis‘ tongue in cheek set design: a tasteless boudour of pink satin, lace curtains and an intimate thrust staging in which the audience are also lit. The pre-show soundtrack of squelchy synth, hits a downmarket wine bar tone, the only thing missing is a bowl of car keys. It is dated, it is provincial, it is oh so British and it sets the tone perfectly. Paul Birch’s technological thriller takes audiences on a journey through reality and the inner workings of the dominated virtual world we live in today. 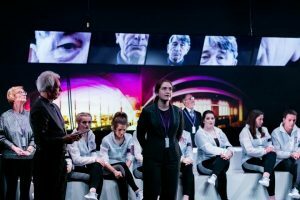 Audiences are made to feel under surveillance, as the stage space is littered with tall screens and futuristic style set pieces that entrap one within the robotically inspired storyline. Courtesy of Shaun Conway Photography. The story of settling into a new culture, having to assimilate and build up a life via independent means is a story that many immigrants share. Often travelling from their country of origin with little income and having experienced tough upbringings, whether that be due to political regimes, limited resources, social climates or for other various reasons, these factors only ever go on to strengthen an individual. 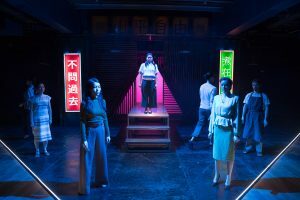 In-Sook Chappell’s Mountains: The Dreams of Lily Kwok taps into this narrative of immigration, a dream play that marries the past with the present. As a teen, figuring out who you are is apart of the daily routine. If you’re not questioning yourself about who you are, then you’ll probably find yourself at the receiving end of others questionable opinions about you. Identity is multi-faceted, Natasha Marshall’s Half Breed responds to this complexity. Courtesy of The Other Richard. 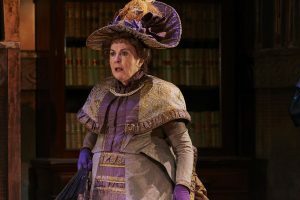 Oscar Wilde’s sophisticated and rib tickling drama takes audiences on a skip through country houses, lavish lounges and troublesome aristocrats. The York Theatre Royal is the perfect setting for this historical masterpiece that has survived the test of time, and is truly a tribute to classical theatre as we know it today. Celebrating the world of modern circus with a diverse range of performances, CircusFest 2018 is not something you want to miss and after a day of lazy sunshine, why not get your blood pumping with some hand to hand acrobatics (don’t panic, I’m not suggesting you start cartwheeling around! 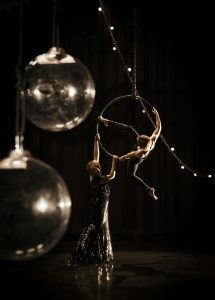 ), by watching an acrobatic duo such as Nikki and JD performing Knot at The Place.